Our services include laser facial treatment, coolsculpting, hair transplant surgery, Thermage skin tightening, laser hair removal, and EnerJet for men and women. Additionally, patients can take advantage of ultherapy, the only procedure cleared by the FDA to non-invasively lift the under-chin, neck, and eyebrow. Apex Medical Center was founded by Dr. Nantapat Supapannachart, who is certified with the American Board of Dermatology and the American Board of Laser Surgery in the United States. Additionally, Dr. Supapannachart has served as secretary of the Association of Cosmetic Dermatology Surgery and Dermatology of Thailand, along with numerous medical associations, including the International Dermatological Society of Thailand, American Medical Association, the International Society of Dermatology, and the International Cosmetic Laser Surgery and Board of Thai Cosmetic Dermatology and Surgery. 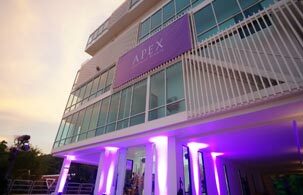 Apex Medical Center recently celebrated its 25th anniversary and remains completely committed to delivering innovative, cutting-edge treatments to men and women of all ages.